There are four main types of paint (or colour) for artists and creatives: Oil, Acrylic, Watercolour and Gouache. Each has different working characteristics and can be used in different ways, depending on working approach, preference and desired results. Within all forms of paint produced for budding creative’s through to professionals there are two main quality grades and these are most commonly referred to as Students quality and Artists or Professional quality. Artists’ quality ranges such as Winsor & Newton Artists Oil, Michael Harding Artists Oil Colour, Liquitex Professional-Artists Acrylic colour or Winsor & Newton Artists Watercolour comprise of colours which are produced from only single pure pigments wherever possible and these make for the cleanest, purest colour mixes. Artists Oil colours have the highest possible colour brilliance, permanence and lightfast ratings. Artists’ colours are differentiated in a series scale which reflects the cost of the pigments used to produce the colour and therefore determining the price. 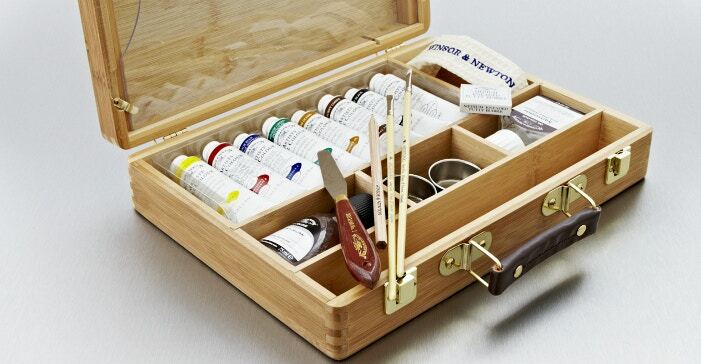 Artists’ paints are for those who require unrivalled colour and performance. Student quality paint ranges feature colours which are produced using a mixture of pigments combined to produce a colour which imitates a pure single pigment colour and this makes them more affordable to produce and use. Student quality colours are also a uniform price across the range and are produced for beginners through to Artists who might be working on a large scale, on a budget or where the purity of the colour brilliance may be of less importance.